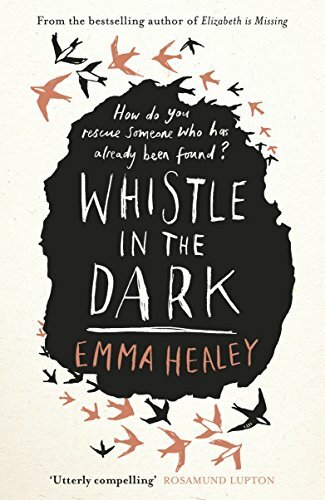 Emma Healey's second novel, Whistle In The Dark, is about a mother, Jen, and her 15-year-old daughter Lana. One day, while the pair are on a painting holiday in the Peak District as a mother-daughter bonding exercise, Lana disappears. She's found a few days later, dehydrated, bleeding from a head injury and with what seem to be rope marks around her ankles, but all she'll tell her parents, and the police, is that she went out to the shower block at their camp site and 'got lost'. The story that unfolds is that of Jen's quest to find out what happened to her daughter during those four days, and of the whole family's struggle to deal with Lana's adolescent depression in the months before and after her disappearance. This isn't, however, a crime story or a psychological thriller, and I think people who pick this up looking for a gripping mystery will probably be disappointed (which I think accounts for some of the more negative reader reviews on Amazon). Instead, it's really more of a portrait of the relationship between mother and daughter - and personally I found it insightful and well-crafted. We learn how Lana got her name - a strange man suggested it when he accosted the desperately sleep-deprived Jen on a train, upon which she was travelling solely in the hope that the noise and motion would soothe her still-unnamed newborn. We learn that Lana has been prone to self-harm, that she can be sullen, difficult, secretive, jealous of her clever, capable older sister Meg, who Lana claims is only gay 'for attention'. There's the family therapy with Dr Greenbaum, who infuriates Jen by referring to her as 'Mum' throughout each session as if she has no identity of her own other than as Lana's mother. And really, that in itself is central to the book - motherhood, the constant anxiety of parenting, and the loss of self that happens not just for Jen but for the whole family when Lana's fragile mental health becomes the focal point of their family life. This makes the book sound terribly gloomy, but surprisingly, it's not. It's often quite witty, full of astute observations, and some of Jen's anxieties about Lana are darkly funny (is she blinking too much?) It's sad too, without a doubt, but by and large the whole family are likeable, so I found myself rooting for them to overcome their problems. Although Lana's behaviour is sometimes infuriating - it's unclear how much of her attitude is a result of her depression and how much of it is standard manipulative teenage obnoxiousness - I found it impossible not to feel sorry for her when I didn't wan't to shake her. There is a resolution to the mystery, but it might not be the one you expect and some might, I think, find it anticlimactic. But I think it has a deeper meaning that's a fitting one for the book as a whole.